heroic struggle against overwhelming odds -- a place where men made the ultimate sacrifice for freedom. For this reason the Alamo remains hallowed ground and the Shrine of Texas Liberty." - from the brochure, "The Story of the Alamo: Thirteen Fateful Days in 1836,"
If you were to ask any number of average American adults what they remember about Texas from high school American History class, I betcha the first thing that would come to most of their minds is the famous battle at the Alamo -- or at least the famous battle cry, "Remember the Alamo," used to rally the forces that subsequently defeated the Mexican soldiers who decimated the small band of Texans who tried so hard to defend their fortress in San Antonio. It's one of those cultural icons that is imprinted on our brains. We may not remember all the details, but we know Something Very Important happened there. 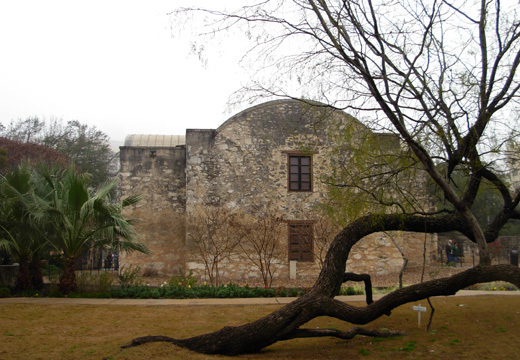 One of those details is that the Alamo was first a Spanish mission, not an American fort. 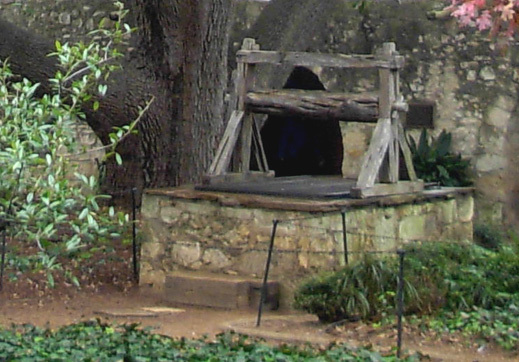 In fact, what became later known as the Alamo was established two years earlier than any of the other missions in San Antonio that I talked about in the last two entries. Like those other missions, this one had a longer Spanish name (Misi�n San Antonio de Valero). 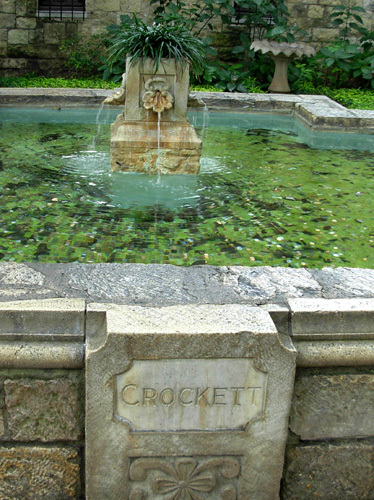 It was home to Franciscan missionaries and Couhuitecan (including Tejas) Indian converts for over seventy years from its establishment in 1718 by Father Antonio Olivares until Spanish officials secularized all the area's missions in 1793-4 and distributed the lands to the remaining Indian residents. They continued living there and participated in the growth of the community developing around them. 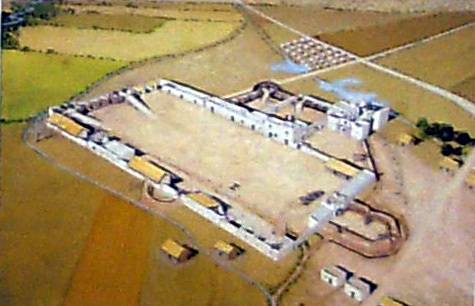 Mission San Antonio de Valero, circa 1760. Picture from the Wall of History at the Alamo site. This site has seen more transitions than any of the other San Antonio-area missions since its inception. In 1803 a Spanish military unit from El Alamo de Parras, Coahuila (currently Mexico) stationed a cavalry unit at the former mission; don't ask me where the poor Indians went because I don't want to know! 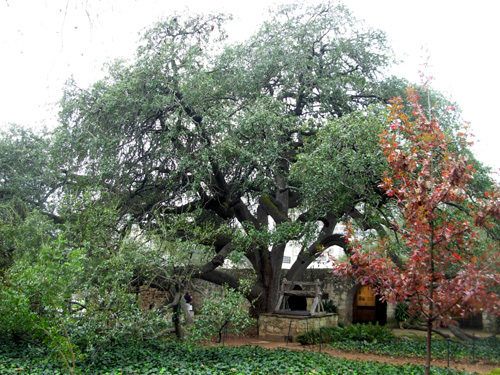 The soldiers referred to the former mission as the "Alamo" (Spanish for "cottonwood," as in trees) in honor of their hometown. According to the pamphlet mentioned above by the Daughters of the Republic of Texas, the Alamo was home to both Revolutionaries and Royalists during Mexico's ten-year struggle for independence from 1811 to 1821. Spanish, Mexican, and then Rebel soldiers continued to occupy the Alamo (in succession, not all at once!) until the Texas Revolution, which began in 1835. There are plenty of details of what happened next in books, movies, and online. We recommend you see the IMAX film "Alamo . . . the Price of Freedom" at nearby Rivercenter prior to touring the Alamo site so you'll have a better understanding of the history of the place as you walk through it. It's a powerful movie on a giant screen. You'll feel like you're in the middle of the action. 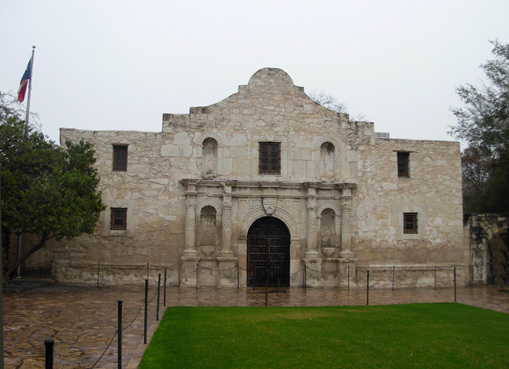 Late in 1835 the Alamo and San Antonio were occupied by Mexican forces under General de C�s, who had fortified the former mission site to protect it from Texan rebels. Wall of History. 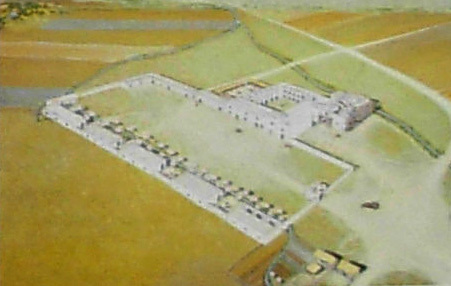 Current site includes the Long Barracks and church in upper R. third of picture. In December, 1835 Ben Milam and his Texan and Tejano volunteers forced the general to surrender. 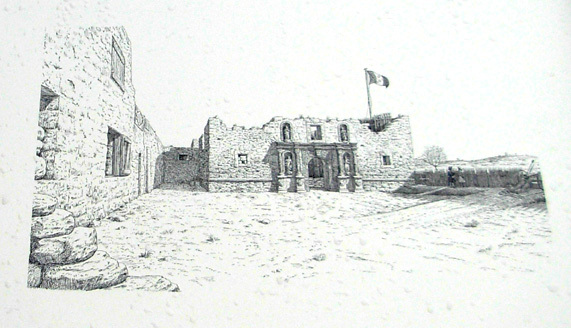 About one hundred rebels remained at the Alamo -- and fortified it even more. That did not sit well with Mexican dictator general Antonio L�pez de Santa Anna. In February, 1836, Santa Anna and his army of about 4,000 troops headed toward San Antonio to regain the fort. When Texas general Sam Houston learned about this, he ordered Col. James Bowie (of Bowie Knife fame) to determine if the post could be held or should be abandoned. Bowie and his men were determined to fight for Texas' independence and did NOT want to retreat. 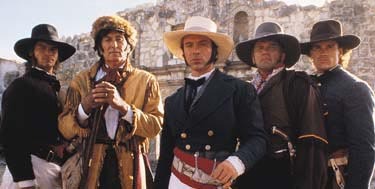 Two other famous Americans historical figures joined Bowie at the Alamo to help defend it against the Mexican forces: Col. William Travis and David (AKA Davy) Crockett, legendary frontiersman and former congressman from Tennessee. Although each brought some more volunteers to fight, the total number of men (mostly volunteers, not trained soldiers) was only about 150-160. Those undaunted Texans and Tejanos attempted to hold the garrison when Santa Anna and his 4,000 troops arrived in San Antonio. Wow. Pretty crummy odds. Just after the siege began, Bowie became too ill with pneumonia to lead the men. Col. Travis took full command on the second day. Couriers were sent to request reinforcements but only thirty-two more men came to help on the eighth day of the siege.
" . . . Our numbers are few and the enemy continues to approximate his works to ours. but I shall hold out to the last extremity, hoping to secure reinforcements in a day or two. will do our memory justice. Give me help, oh my Country! Victory or Death!" before the siege. From a sign in front of the Alamo. The situation looked impossible if the Texans tried to beat the huge army poised outside the garrison. But they were a determined lot, ready to give their lives for independence. Miraculously, they held their ground for thirteen days until Santa Anna finally had enough of "negotiating" with the rebels, and attacked the Alamo with full force. Legend has it that Col. Travis gathered all the soldiers together on the twelfth day when he realized no more troops would be coming to help. During a rousing speech, he gave the men three choices: surrender, try to escape, or stay and fight. Travis drew a line in the dirt and asked anyone willing to stay and fight (to their death, obviously) to cross the line. Everyone did except one man, Moses Rose, who chose to leave. No one voted to surrender. 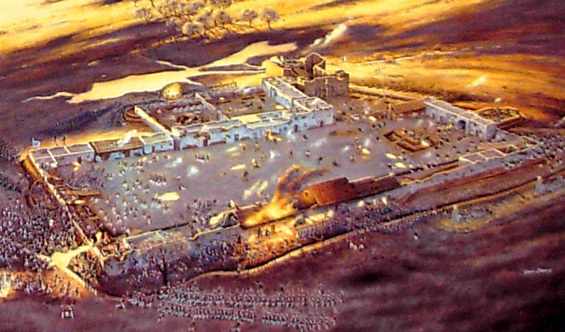 Artist's depiction of the battle at the Alamo on March 6, 1836. From the Wall of History at the site. 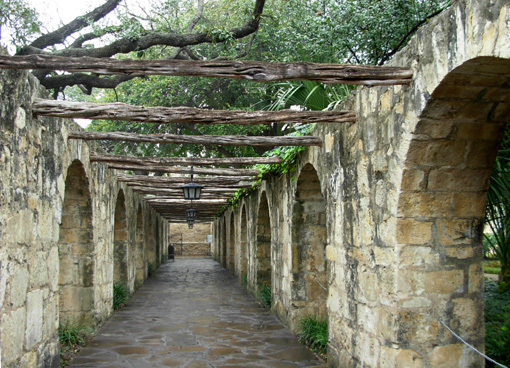 Before dawn on March 6, Santa Anna's army stormed the north wall of the Alamo, killing Travis. The desperate struggle continued for about an hour and a half. By 6:30 AM it was over. All 189 of the defenders were dead, including Davy Crockett and James Bowie. (But they had killed even more of the Mexican soldiers first.) Santa Anna entered the Alamo and declared victory. A dozen or more women, children, and Travis' slave survived the siege inside the Alamo, despite the rampage around them. That says something for the Mexican soldiers, who could have easily killed them, too. That battle was over but the fight for Texan independence certainly wasn't. It served to reinforce the patriots' resolve to defeat the Mexicans, which finally happened two months later near the San Jacinto River east of Houston when Sam Houston led his troops to victory over Santa Anna in a fight that lasted only eighteen minutes. Their rallying cry? "Remember the Alamo!" Sometimes it's nice to have the last word. With the capture of Santa Anna, the independence of Texas was won. The Republic of Texas was born. Between 1836 and 1876 there were many more changes at the Alamo, from considerable deliberate destruction to the buildings when the Mexican forces had to leave after the Treaty of Velasco, to occupation and repairs of the ruins by the U.S. Army after Texas became a state in 1846. At various times, both U.S. and Confederate Armies used the Alamo as a quartermaster depot (military warehouse, in civilian-speak). 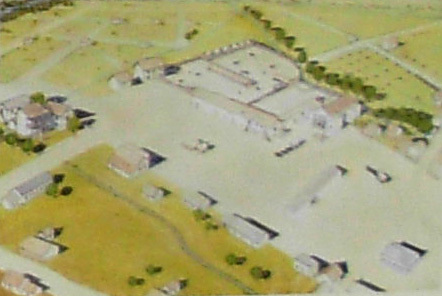 The Alamo site, circa 1861, when it was used by the Confederate Army as a warehouse. Painting from the Wall of History exhibit. In 1876 all the property except the church was sold to private interests for commercial use. The city of San Antonio gradually took over the former battlegrounds. 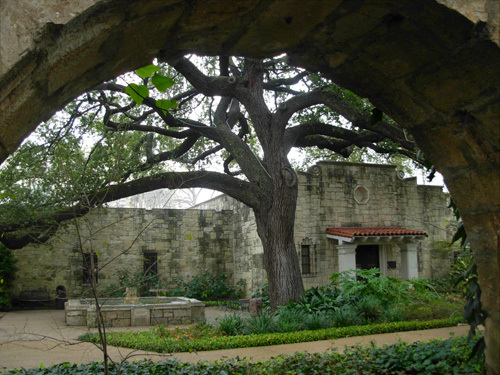 By the early 1900s, commercial property encroached on the historic mission buildings that remained, such as the church and Long Barracks. 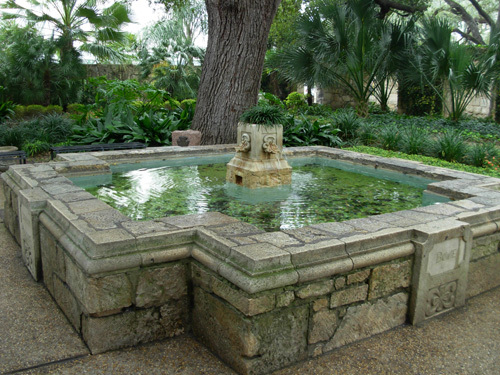 Some individuals and The Daughters of the Republic of Texas (DRT) recognized the importance of preserving the site for future generations and persuaded the state to purchase the remaining property as a shrine. The DRT received custody of the site in 1905 and continues to maintain it "as a sacred memorial to the heroes who immolated themselves upon that hallowed ground." Col. Travis would be proud. 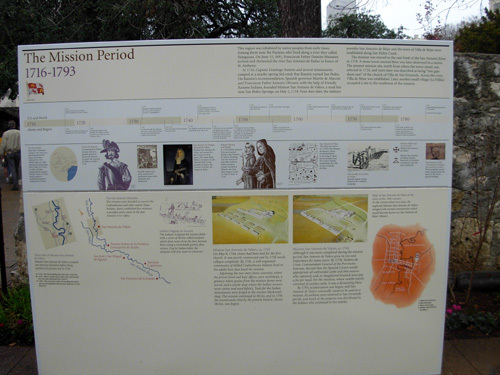 Not only were there numerous changes to the Alamo from its humble beginnings as a mission until the state took it over, but even more changes have occurred to the site in the past hundred years. modern building in the background. When you enter the grounds of the shrine, you quickly feel transported back in time. There is a palpable sensation of history and reverence. 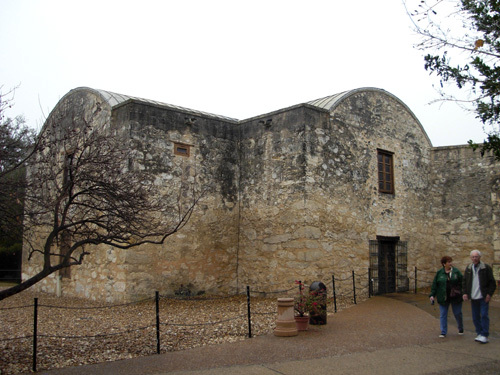 Exhibits in the church and the restored Long Barracks feature artifacts from the era of the Texas Revolution and some personal items that belonged to the heroes of the Alamo. An old fire station has been restored as a meeting hall on the property. Several new buildings were constructed to house a library, offices, gift shop, maintenance shop, greenhouse, and restrooms. Although the stone walls and arches surrounding the site look really old, they date from the 1920s. Yeah, eighty-something years is a long time, but that's modern history in the context of the Alamo! You can still see part of the old acequia (irrigation system) and a well in the convento courtyard that date back to the mission period, however. 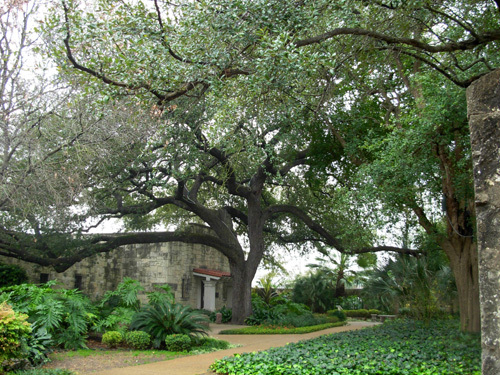 Scheduled 20-minute history talks are offered in the Alamo Shrine. A 17-minute documentary film produced by the History Channel runs continuously in the museum in the Long Barracks. Since we'd already seen the IMAX movie and read other information about the Alamo before visiting the site, we chose to wander around the place at our own pace. 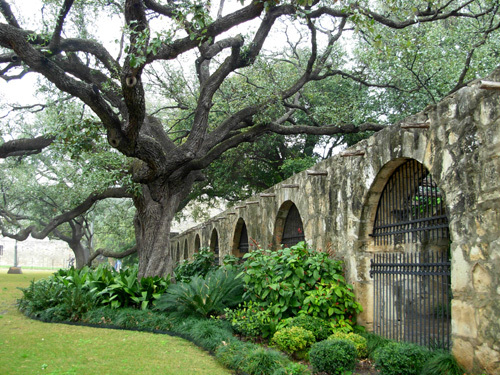 There are numerous exhibits, plaques, and signs that explain the entire history of the Alamo. 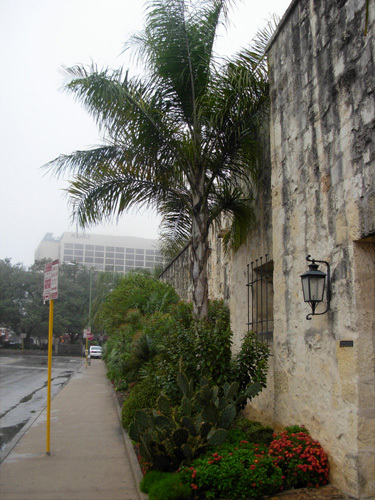 We visited the Alamo on an overcast weekday morning in January after a rain shower. Although it was cool and not as crowded as it is on the weekend, there were still a bunch of people milling around. 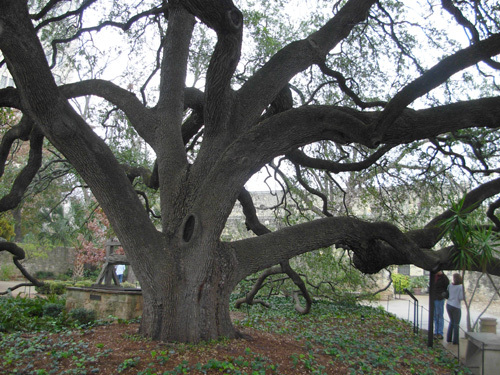 It's a very popular tourist destination and located near other popular sites like River Walk, Rivercenter, various museums, the downtown visitors' center, and Hemisfair Park -- so it stays pretty busy, and more so on nice weather days. Still, we found the courtyards and passages to be pretty quiet. People seemed respectful of the sanctity of the place and mindful that others might want to reflect on the significance of everything that has happened there. Compared to the other four missions we visited, the atmosphere at the Alamo is considerably more somber. Entry into the Alamo is free to all visitors. With no monetary support from the local, state, or federal government, the DRT depends solely on money from donations and proceeds from the gift shop to preserve the complex and maintain the exhibits. Parking on the street or in public lots isn't cheap unless you walk several blocks, but it isn't as pricey as some cities we've visited. That's the conclusion of our visit to San Antonio. Now we're off to Huntsville State Park north of Houston for some more Texas adventures!